On Friday I took the day off work and me and my Mom went to Liberty, NC to the semi-annual antique festival held at a local farm. We were very excited to check it out because we had recently read about it in Our State magazine and learned that over 400 vendors from several states come to sell at this event. We felt like we would find some things that we didn’t typically see at the Raleigh Flea Market. There was a lot of stuff for sure! We had fun looking through it all. I considered this green dresser. I’ve been looking for a smaller one for my closet and this one was a good deal at $40 but I passed it by. Overall we thought the prices were a bit high. These signs were $125 each. This booth was set up by The Gypsy Paint Brush and Victoria spotted me as a blogger with my camera in hand. We struck up a conversation which was great and I learned that she paints with Anne Sloan Chalk Paint, the frame here was Louis Blue with Old White over wash. She had beautiful furniture and shabby chic accessories. The finds were plentiful but the rain rolled in and it rained and rained…. And rained! Here is my Mom taking refuge under a vendors tent. So here I am soaked and ready to leave. I found the fan for $25 and the Beech-Nut sign for $25 as well. The sign is not vintage but holds a special place in my heart and memories of my Grandfather. I didn’t even haggle on the price…it’s priceless! Here is my fan in it’s new home. I loved that this had the red center and the green base. This little bottle was my other find at the festival, I bought this from the Gypsy Paint Brush. It is such a pretty color and reminds me of the beach. After the sale, me and my Mom were both itching to go to yard sales, estate sales, and Goodwill to find REAL DEALS. And as luck would have it my brother told my mom when she got home about an Estate Sale near them on Saturday. So off they went. About 3 in the afternoon she called and said she bought me a bunch of furniture and I needed to go pick it up. When I got there it was like a pickers Heaven! So much stuff! And the sale had started on Thursday!! So…she paid a whopping $15 for a whole room of junk and look what I scored! A pretty twin bed ready for a dip in some fresh paint. This looks like a pie safe that is missing doors, but I have plans for it just the way it is. Six of these drawers with glass fronts. I did a little research today and I think they are drawers form a seed pack display cabinet. I may see about having a cabinet made for them or I may just use these for storage. Once cleaned up I think the wood will look fine. This is a small side table in parts and will have to be put back together but I think it will work. This dresser is the reason my Mom bought the room for me. It is the perfect size for my closet and a much better deal than the green one above. It needs some repair work in one of the drawers and it has a crack on the top but I think it will be just right. And I actually like the color, I think I’m going to try to match it. Bonus items were the books, great for decorating and this skeleton key. My Mom also took home some linens from the room that were in great shape and vintage. There was one other dresser in the room but it was in pretty bad shape and just wasn’t worth hauling it home. But for $15 Dollars!!! What a score!! THANK YOU MAMA!! 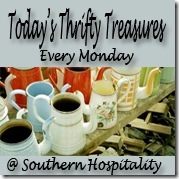 What thrifty finds did you pick up this weekend? I love going to the Antique Fairs, you get to see so many unique things, however I agree most of the stuff is pricey. Love the fan (I also have one with a red center). Love that you share the adventure of treasure hunting with your mom (I do too). That's my idea of a fun day!! LOVE those boxes with the glass fronts!! I've never seen anything like that before! What a GREAT GREAT WEEKEND!! !